Ahoy there landlubbers! Why not take a trip of a different kind with Captain Cook, not to the unexplored South Pacific region, but instead to the fantastic Captain Cooks Casino, offering a wealth of top quality casino games to pick from and not to mention an outstanding new player bonus. What games are available at Captain Cooks Casino? Just as Cook himself discovered new worlds around the globe on his voyages, you too can discover an abundance of riches when it comes to the outstanding choice of casino games that there are available at Captain Cooks ﻿﻿﻿﻿﻿Casino. With over 510 outstanding games available to play on the site, you will never be short of choice of something to play. Why not try your hand at a wide variety of card games, including the hugely popular Blackjack as well as other games including Baccarat, Pai Gow Poker and even a superb version of Vegas 3 Card Rummy to try. Video Poker fans are also well served with an outstanding choice of games including single hand and multiple hand versions. When it comes to slots however, Captain Cooks Casino is in another league. There’s hundreds of fantastic slot games to choose from including some of the biggest modern blockbuster slots available today such as Game of Thrones, Bridesmaids, Tarzan and Terminator 2. There’s a fantastic choice of classic slots too including both the Avalon and Thunderstruck series of games. Best of all, you could win a life changing amount of money on the wide choice of progressive slots available including Major Millions, Tunzamunni and the Millionaire Maker slot Mega Moolah, the world record holder for the largest online jackpot payout ever awarded by a slot game. There’s lots of other games you can try too including Ballistic Bingo, Keno, Sic Bo, Craps and another huge casino favourite Roulette and a large choice of other one off games, such as the hilarious Granny Prix, that offer you many different ways to wager cash. How can I sign up at Captain Cooks Casino? 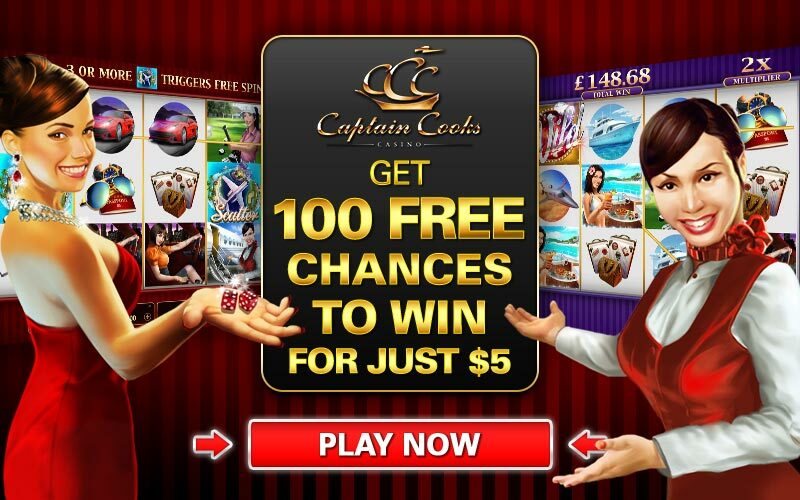 To sign up, simply head to the Captain Cooks Casino site and download the casino software. Once installed, simply register your details and within seven days, make your first deposit. At this point you’ll receive an outstanding new player bonus on your first deposit of £5, as you’ll receive 100 spins on the Mega Moolah slot. This means you have 100 chances for just £5 to win a life-changing amount of money that is measured in millions of $. However, the bonuses as a new player don’t end there. You receive deposit bonuses on your second, third, fourth and fifth deposits of between 25% and 100% of the amount you deposit meaning you could receive up to £500 in bonus cash to play with, alongside the cash you deposit into your account. What is Captain Cooks Casino about? Captain Cooks Casino inspiration is the legendary explorer, cartographer and leader Captain James Cook. This esteemed Royal Navy skipper earned legendary status for being the first westerner to discover the east coast of Australia, many Pacific nations (including Hawaii) and to make the first circumnavigation around New Zealand. Indeed, the straits that separate the two main islands in New Zealand now bear his name. Are Online Casinos a Scam? Canadian Gambling Choice reviews online casinos and online games in Canada. © 2019 CanadianGamblingChoice.com. All rights reserved.